Luca Silvestrini’s Protein has established a well-deserved reputation for imaginative, witty dance theatre. His LOL from five years ago was a hilarious exploration of new technology and relationships and was nominated for the 2012 National Dance Awards. With his new work, May Contain Food, examining food from a variety of perspectives, Silvestrina collaborated with the gifted composer, Orlando Gough. A particularly apt choice, as Gough is a keen cook with a published cookbook to his name and is credited not only with the music but also the recipes. The audience enters the Robin Howard Theatre to find themselves in a restaurant space with tables around the edges, each one with different varieties of fake or real food and decorations. The performers fuss around us providing menus and water under the bossy direction of a maître d’. Then the eight performers gravitate to a table at the centre to begin this hommage to food and its social and relationship contexts in today’s world. The cast have their own specialities, but all take part with great skill in the various components: movement, a cappella singing and acting. Orlando Gough is no newcomer to dance – he composed the music for Shobana Jeyasingh’s terrific film, Duets with Automobiles, and again here, his unusual harmonies are fascinating in themselves as well as often providing a sound scape for the action and less hectic moments in the performance. Sonya Cullingford combines a beautiful high voice with compelling movement quality and Donna Lennard not only has a powerful and clear singing voice, but also has much fun trying to persuade audience members to try a spoonful of some concoction. movement to fine comic effect. Darker moments concern eating meat. Donna Lennard extols the wonders of different meats and birds while leaving a trail of blood on the wall behind. Later on some of the performers strip outer layers and present parts of their bodies on platters to we customers. But a paean to vegetarianism, with the repeatedly sung message that we shouldn’t eat anything that lives, has a dissenter trying to point out that vegetables are also alive. More fun comes with a food aesthete trying a number of fruits and vegetables, initially extolling their virtues only to be disappointed when they don’t come up to expectations with Martin George’s hilarious outbursts getting louder and wilder. The dancers weave close to our tables and the contemporary movement is always interesting and effective in the varied scenes. Some of the most memorable dance comes near the end when the full cast move around a central table, facing inwards, then out, circling, using it for support, always in perfect unison in contrast to the carefully choreographed chaos of much of the work. There is no attempt to change our eating habits, but perhaps the overall idea is to be more aware of how food and the customs and social mechanisms surrounding food are not to be taken lightly in the world of today. 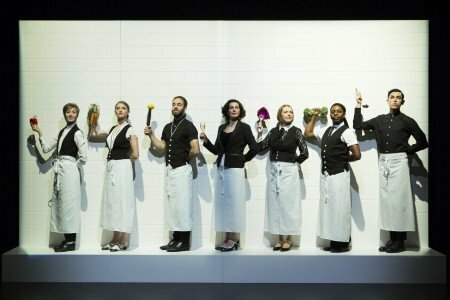 Above all, May Contain Food is a brilliant entertainment that deserves to be savoured by anyone seeking imaginative dance theatre. I may well avail myself of a second serving.